If you haven't enjoyed Wolf Erlbruch's illustrations before, now is the time. 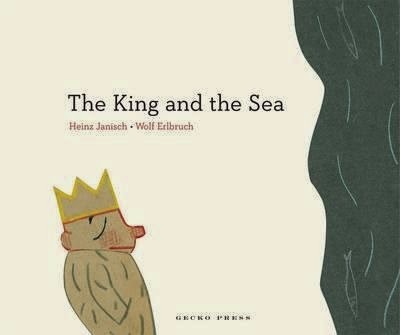 In this charming book of ultra-short stories (as few as 25 - 60 words), we meet a rather impassioned little king. Well, 'impassioned' ... maybe autocratic in the extreme!? As the king attempts to pass rule over every single thing that crosses his path, from the rain to his very shadow, the reader hopes he will begin to see that the majesty of life is in the world around him, not within himself. These stories are so utterly abstract and charming, they will also enchant adults. Younger children will enjoy the abstract meaning via association, and older kids will also glean much wisdom and humour. Erlbruch's iconic illustrations utilise the striking mixed media processes he's renowned for, using collage-like effects, pencil and divine, earthy colour, drawing parallels to The Little Prince by Antoine de Saint-Exupery.